Powers/Abilities: Good fighter, athletic. Knows judo. History: Rusty Ryan led the Boyville Brigadiers, a band of colourfully clad fighters who took on the Axis in the Pacific. After the war they continued to sail around the islands, having adventures. Comments: Rusty Ryan appeared in Feature Comics between #32 and #135. Rusty's strip is a little bizarre - in examples I've seen, he encounters Japanese soldiers who are not drawn in a racist manner, he is accompanied by the Muslim Alababa, who (excepting the name) is a positive portrayal and not drawn in a racist manner (his clothing is a bit stereotypical, but otherwise he's not too bad)...and he is friends with Pierpont, an unbelievably stereotypical black man who looks and talks like an escapee from a Black and White Minstrel show - huge lips, straw boater, the lot! 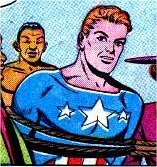 Rusty and his cohorts, the Boyville Brigadiers, all wore identical costumes that should have had lawsuits from Timely Comics winging their way over for copyright infringement on Captain America.